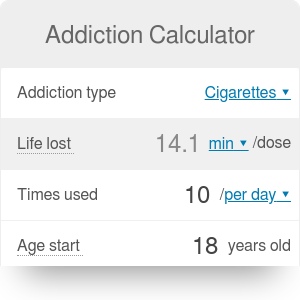 Addiction calculator tells you how much shorter your life would be if you were addicted to alcohol, cigarettes, cocaine, methamphetamine, methadone or heroine. cocaine - one gram per day, split into 6 uses (see our weight converter). To use the tool simply choose one of these from the drop-down list and enter a daily dose of respective drug and your age when the habit is picked up. If you want to base it on life expectancy in your country life expectancy in your country, Wikipedia comes to the rescue, as always. I imagine there are small areas where you could say "wait, but", such as the one where they dismiss the fact that average life expectancy includes addicts (and people who died at an early age) or the fact that shorter lifespan isn't only related to health issues (also to accidents, crime-related deaths). Also, it's just statistical data - particular cases might be far from an average. The calculator is meant to raise awareness around the gravity of the problem. Please feel free to fill in the numbers and share the "link to this result" on Facebook or Twitter. Addiction Calculator can be embedded on your website to enrich the content you wrote and make it easier for your visitors to understand your message.